Heritage Todd Creek is a Lennar Homes 45+ active retirement community in Thornton, Colorado. The community is spread across 700 acres and will feature 1,300 homes upon completion. Residents enjoy luxurious resort-style living in a community that features breathtaking views of the Rockies, an 18-hole golf course and a clubhouse. Heritage Todd Creek is designed to provide active adults with a community filled with social and fitness activity. Whether you enjoy golfing, mingling with neighbors, taking part in any of the dozens of clubs and interest groups or simply letting your cares melt away by the pool, there is something for everyone in Heritage Todd Creek. Plus, a delightful lineup of single-family and duplex homes means there is a home size, style and price range to suit almost any buyer. A magnificent 33,000 square-foot clubhouse provides the centerpiece for all community activities in Heritage at Todd Creek Colorado. 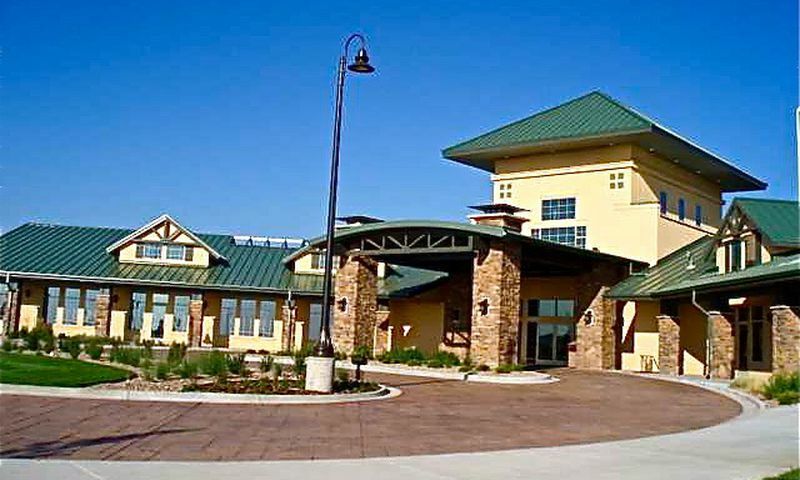 This grand facility features a lineup of amenities uniquely crafted around the needs of active adults. It includes a state-of-the-art fitness center with an aerobics and dance studio, craft room, ballroom, library, billiards and an indoor lap pool. Outside, a resort-style pool and spa overlook the golf course and nearby mountains. There are also two tennis courts and walking trails that meander through Heritage Todd Creek. The Heritage Todd Creek Golf Club is a 7,435-yard championship course designed by renowned golf course architect Arthur Hills. This 18-hole, par-72 course features a mixture of undulating fairways and strategic bunker placements that require careful shot placement. The course includes a practice facility, pro-shop and restaurant. The Creekside Restaurant at the Heritage Todd Creek is a favorite among golfers and Heritage Todd Creek residents. The restaurant is an ideal spot to gather with friends after a round of golf or a cozy retreat for a romantic dinner with your significant other. It includes a bar and lounge alongside an elegant dining room. There are a number of real estate options for homebuyers at Heritage Todd Creek. Construction of the community began in 2006 and it will eventually contain approximately 1,300 homes upon completion. There are a total of 20 different floor plans available in the community that include eight single-family and four duplex ranch home models available for purchase as new construction from Lennar Homes. Additionally, there are a limited assortment of pre-owned resale homes that include the original eight single-family home models and four townhome floor plans. All homes include a minimum of two bedrooms, two bathrooms and a two-car garage. Larger homes have an additional den or bedroom and some of the single-family homes include a three-car garage. The homes have desirable features designed for the needs of active adults including large great rooms, open kitchens and spacious patios. Plus, Lennar includes many upgrades in their homes such as Corian countertops, energy efficient appliances, unfinished basements and upgraded flooring. At Heritage Todd Creek, a community activities director helps cultivate an atmosphere that offers the ability to lead a well-rounded and active lifestyle. A community calendar provides fun activities that include everything from golf and tennis to cards and crafts. There are other fun clubs such as wine tasting, Red Hatters, Pilates, bridge, line dancing and more. Other exciting activities in Heritage Todd Creek include trips to local museums, neighborhood concerts and even skiing and hiking trips in the nearby Rockies. Heritage Todd Creek is located in Thornton, Colorado just 25 minutes from downtown Denver. It is conveniently located off Highway 7 just east of I-25 and north of 470. This ideal location provides easy access to many nearby attractions. Places like Boulder, Fort Collins and Greeley are accessible in under an hour and the Denver International Airport is only 25 miles away. Everyday shopping conveniences such as grocery stores, pharmacies, restaurants and coffee shops are located within 5 miles of Heritage Todd Creek in nearby Brighton or Thornton. Recreational enthusiasts can get there fill of nearly any imaginable activity within two hours from home. Heritage Todd Creek is surrounded by mountains and reservoirs that are perfect for boating, hiking, mountain biking and snow skiing. Clubhouse - 33,000 Sq. Ft. There are plenty of activities available in Heritage Todd Creek. Here is a sample of some of the clubs, activities and classes offered here. The Traditions Collection at Heritage Todd Creek features ranch-style duplex homes ranging in size from 1,417 to 1,700 square feet. Each model includes a 2-car garage and partial unfinished basements. These lock-and-leave units include exterior maintenance, lawn-care and snow removal provided by the association. This collection is available on a resale only basis. The Champions Collection features ranch-style single-family homes ranging in size from 1,613 to 2,134 square feet. All homes include 3-car garages and full unfinished basements. The Heritage collection offers single-family homes that range from 1,187 to 2,749 square feet . They will have 3 to 4 bedrooms and 2 to 3 bathrooms. All homes will also have attached 3 car garages. The Legends Collection features ranch-style single-family homes ranging in size from 2,024 to 2,574 square feet. All homes include 3-car garages and full unfinished basements. Homes are nice, but Lennar doesn't allow customization. Choose a model and there is very little room for customization. The golf course is a PUBLIC Course and there are no benefits to the members of the community. We pay day rates, just like everyone outside the community. Don't move here expecting anything special regarding golf privileges. Heritage is a well thought out planned and designed community! The grounds meticulously groomed, the clubhouse amenities are up to date , the golfing is great and the views are breathtaking. We moved from ranch with 2.5 acres into Heritage Todd Creek community 3 years ago and have one regret.. that we didn't do it sooner ! There's a since of cohesiveness in the community, neighbors and friends that give back to the surrounding area ( volunteering at schools, charity events etc.). We would love to keep it a secret and a hidden gem but once someone visits here they want to be a part of us. Buyer beware. This website says there are walking and biking trails. There are roads and sidewalks but no public trails. The golf course has trails for carts, but that can only be used by golfers and no bikes are allowed. Also, the clubhouse and amenities including the restaurant, pools, etc. was fine for the first phase of homes, but can barely accommodate the homeowners now. They are building more and more homes and Lennar will not invest in expanding the clubhouse to accommodate the increase in homes . As homeowners we also do not own the golf side of the clubhouse with the restaurant. There have been issues with payment from the Golf club for expenses due to the Association and talk of buying the restaurant. I don't want that to happen as I expect our HOA to increase if it does. Last, but most important, don't let the gates fool you. This is NOT a gated community. You can walk, ride a bike and even drive a car onto a private road (which you are not allowed to do but there is nothing stopping you) right into the community. What good are gates if you can do that. Buyer beware! So far so good! We just moved in a few months ago and love it. So far my favorites are the indoor pool, the craft room and the restaurant. We've met a lot of neighbors just walking around the community. Everyone has been very friendly and welcoming. Our new home is perfect. It's 3 bedrooms and 2 baths, lots of closet space and plenty of room for my scrapbooking and my husbands model cars. I am excited by what the future holds for us here! 55places.com is not affiliated with the developer(s) or homeowners association of Heritage Todd Creek. The information you submit is distributed to a 55places.com Partner Agent, who is a licensed real estate agent. The information regarding Heritage Todd Creek has not been verified or approved by the developer or homeowners association. Please verify all information prior to purchasing. 55places.com is not responsible for any errors regarding the information displayed on this website.